The Crown Heights Film Festival begins tonight at FiveMyles! Doors open at 6:30, screenings begin at 7:00. There will be a Q&A session at the end of the night. Admission is suggested donation at the door. We have a wonderful line-up of local and international films for Halloween tonight. Visit us again for a new line-up of films everyday through November 10 at FiveMyles and FREECANDY. 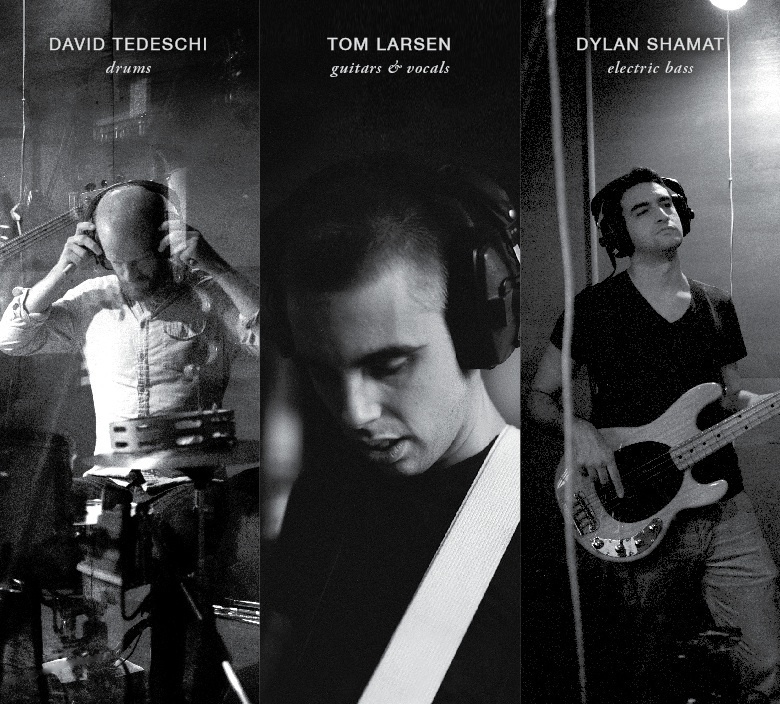 On certain nights there will be live music performances following the Q&A sessions; a variety of concessions are available at both venues. Please note films may contain adult content. For younger audiences, please join us at FiveMyles and The Candy Rush for the matinee sessions on Sunday, November 4. Visit our website for the full festival program and venue information. Thank you all for continuing to support CHFF. See you soon! - The Crown Heights Farm Share will hold their pickup tomorrow (Wednesday) at Georgia's Place from 5-8pm. 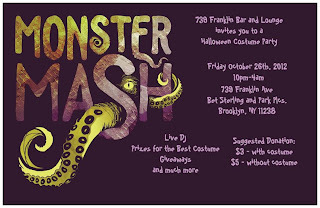 - The Crown Heights Film Festival postponed their opening night (planned for this evening), but tomorrow's Halloween films are going ahead as of right now. If, like many New Yorkers, you'll have tomorrow off from work on account of the continuing transit snarls, consider volunteering by sending your name, email address, and borough to nycservice@cityhall.nyc.gov. We on Franklin did fine, but there are many in our city who are still hurting and could use the helping hand. It's getting ugly out there for those who live closer to the harbor, but Crown Heights is (knock on wood) relatively out of the way of most of the immediate dangers. If you live in an area threatened by flooding, our thoughts are with you, and please, stay safe (e.g. don't get your jet ski out). If you're cooped up at home, you'll sympathize with the efforts of three local roomies who've decided to fight cabin fever with red wine and document the whole thing at Storm Watchers. If you dare brave the elements, the Crown Inn and Franklin Park are both open and rocking. Seen on this morning's pre-hurricane run: lots of local businesses open on Franklin (including, in no particular order, most delis/bodegas, Mayfield, Sweet Basil, Little Zelda, 739 Franklin, J's Wong, Excelsior Bike Shop, LaunchPad, Chavela's, Pine Tree, Nam's, Bob & Betty's, Pulp and Bean, and Dutch Boy Burger/Franklin Park), a line outside of Wino(t), which was just opening at noon and already had a line (quoth the lady, "it's a good day for red wine"), leaves blown off the top halves of the trees that line Eastern Parkway, which made them look as though they'd suddenly acquired male pattern baldness, plenty of joggers heading into Prospect Park and plenty of traffic moving around Grand Army Plaza, coffee shops just packed down Flatbush (everyone's a freelancer when the subways aren't running), Cubano Cafe completely boarded up (quoth the lady, "they may know a thing or two about hurricanes"), people scrambling to gather fallen ginko berries atop Fort Greene Park, and the beginnings of storm damage along Fulton (some downed awnings and construction fences). Stay safe and dry, everybody. ILFA's always a big booster of local business, but it's not as though anyone's going into Manhattan for their food and drink tonight. Still, I'm sure those who came into work would be glad to see patrons, so if you've got a good raincoat, why not go out and say hello? If you're looking for an evening out that doesn't involve a costume, swing by Thirstbaravin (Pacific and Classon) tonight from 7-9. A $10 donation gets you your first glass of wine. 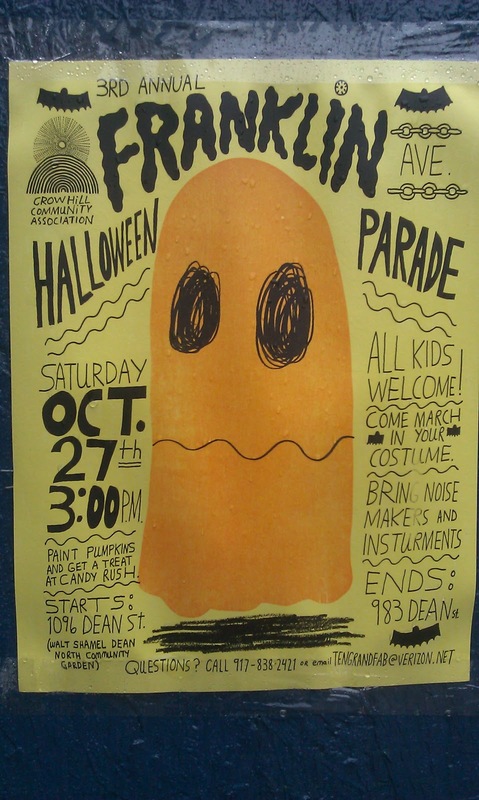 Lots to do this weekend to celebrate All Hallows Eve. 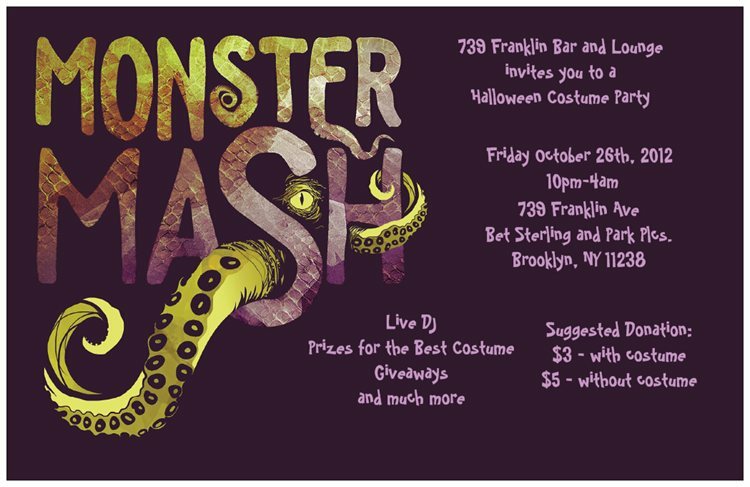 If you're sitting around right now thinking "man, it's 11:30 on a Friday night and I've got nowhere to go in this awesome Gumby costume" then you should head over to 739 Franklin, where the Monster Mash (see flyer above) will be raging for another 4 hours. 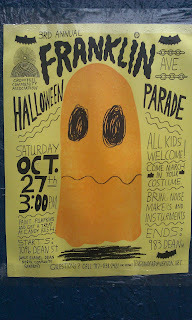 Tomorrow, kids can join in the 3rd Annual Franklin Halloween Parade, which starts at the Walt L. Shamel Community Garden (Dean between Franklin and Bedford) at 3pm, and will march up to the Candy Rush for a tasty treat before heading back down the avenue to Mike Perry's 983 Dean Street Studio (the home of Wondering Around Wandering) for a final kiddie bash. There are also great events going on all weekend in Prospect Park (including at the zoo) thanks to the Heart of Brooklyn folks. Tonight, Professor Barbara J. 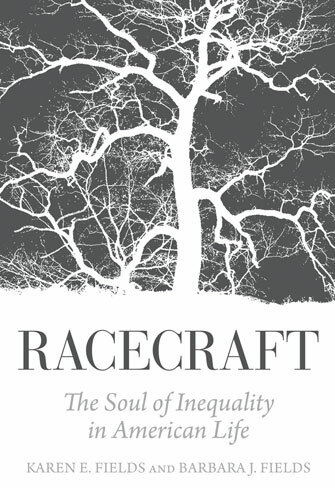 Fields of Columbia's Department of History (where ILFA is a grad student) joins her sister, Duke University sociologist Karen E. Fields, to discuss their new book, Racecraft: The Soul of Inequality in American Life at the Brooklyn Museum at 7pm. A description of the book, released by Verso, is below, and more information about the event can be found here. Most people assume that racism grows from a perception of human difference: the fact of race gives rise to the practice of racism. Sociologist Karen E. Fields and historian Barbara J. Fields argue otherwise: the practice of racism produces the illusion of race, through what they call “racecraft.” And this phenomenon is intimately entwined with other forms of inequality in American life. So pervasive are the devices of racecraft in American history, economic doctrine, politics, and everyday thinking that the presence of racecraft itself goes unnoticed. *$4 beer and well drinks with a minimum $10 on-site donation towards Obama’s re-election. Online donations, checks and cash will be accepted. Contribution forms will be filled for all donations. 100% of funds raised will be given to the Obama Victory Fund 2012. It's a great fall Saturday in Crown Heights. If you're up early, check out the Dean Street Farmers Market (between Franklin and Bedford in front of the Walt L. Shamel Community Garden) from 8am-2pm. 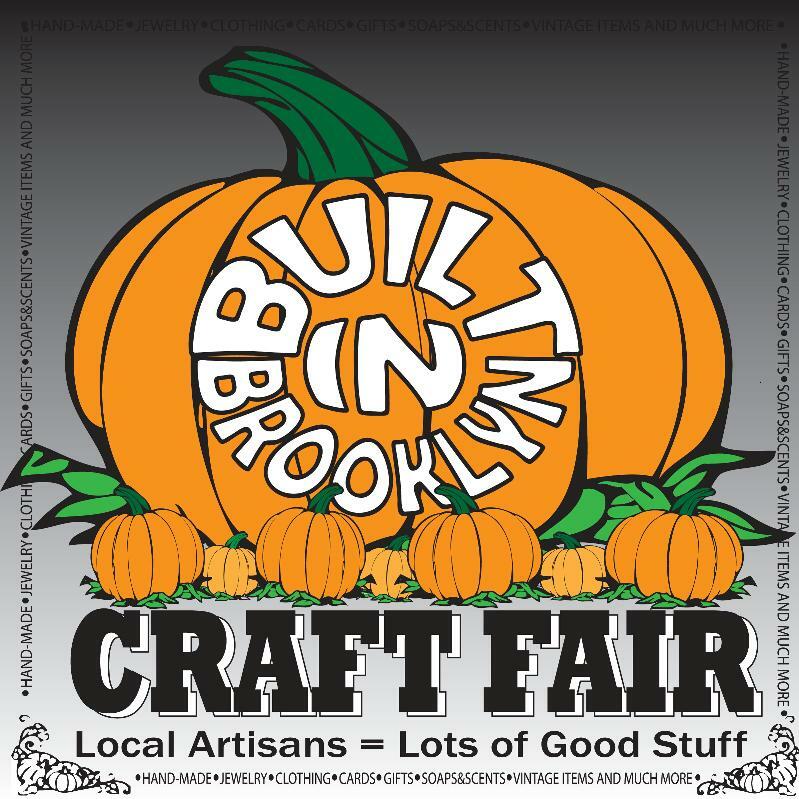 Then spend your afternoon checking out the latest edition of the Built in Brooklyn Craft Fair and Tastes of Brooklyn (not actually in Crown Heights, but organized by Crown Heights non-profit Seeds in the Middle). Tuesday's CHCA meeting laid out some goals for the coming year, which included developing initiatives in five key areas: community building, safety, merchants (FAM will be taking the lead on this), Beautification, and one that catches ILFA's eye, Development Watch. Essentially, the CHCA hopes (with the help of community members) to do two things. 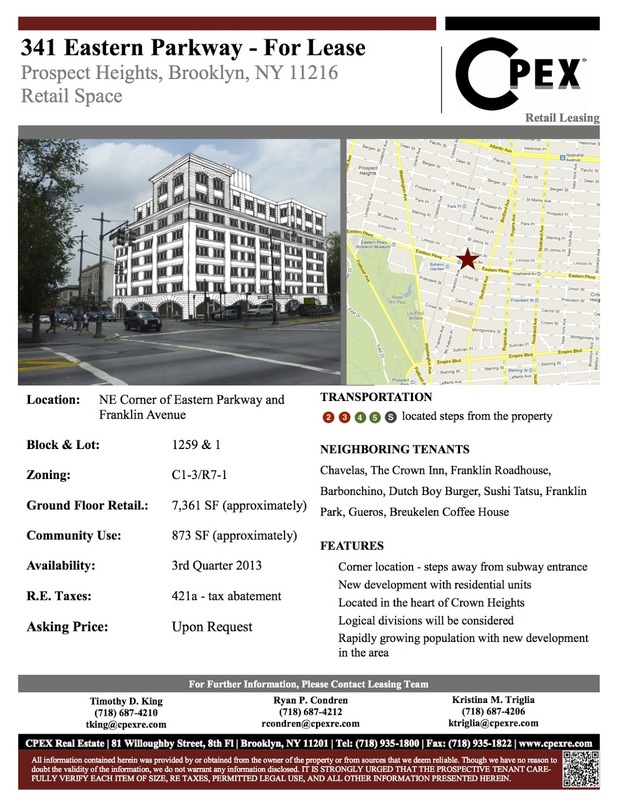 Firstly, they want to keep residents informed and abreast of new plans and new developments, from zoning changes (there's a proposal in the works to "upzone" - allow taller buildings - along commercial corridors in Crown Heights) to big projects (like 341 Eastern Parkway and 1000 Dean) to individual storefronts. 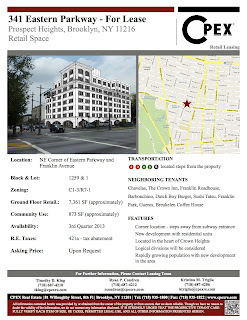 - 341 Eastern Parkway is under construction (click on the flyer above for an idea of what it will look like when its finished). As one of the most observant locals I know put it, "the fact that they painted over that mural says a lot, because they didn't need to." 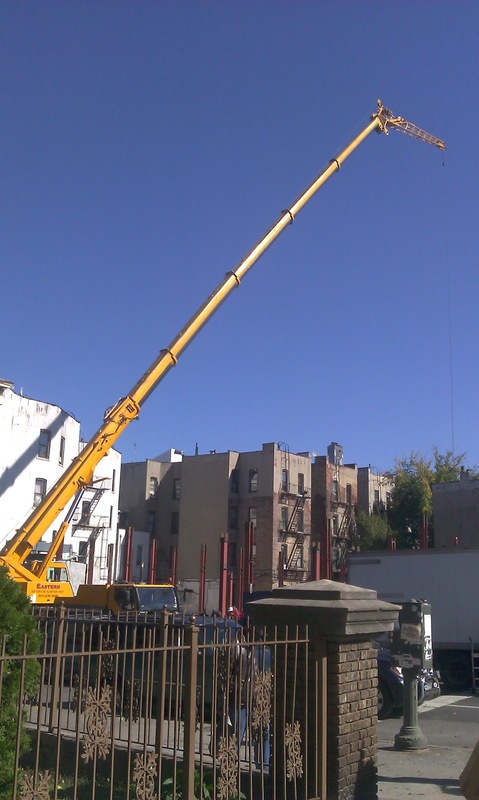 - Other big projects: a construction fence is up and work appears to be starting on the 505 St. Marks development (94,000 square feet, 128 residential units, as reported last year. 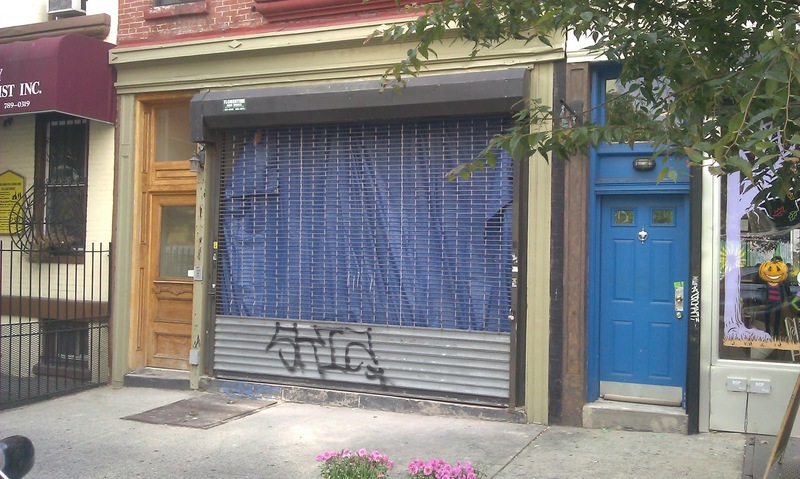 - Last summer, ILFA claimed that every storefront on Franklin's hottest block (between Sterling and Park) had been occupied. Readers were quick to point out the error - one remained, next door to the Candy Rush. It's under construction, however, so it appears at least part of my post will soon be correct. The CHCA is planning an event on Wednesday, November 14 at 983 Dean with some folks from the Pratt Institute to open up some conversations about what these changes mean, what community members want from them, and how they might influence the process. Until then, readers, there's always the comment threads! It's a great night for politics in Crown Heights - you can get your local updates at the CHCA meeting at 7:30 (see post below) and then saunter across the street to catch the 2nd presidential debate at 9pm at Little Zelda or 739. As reported on DNAInfo, the local crowd is a fun one for debate-watching. Also, if, like ILFA, you're wasting your day checking random polling sites and politiblogs, check out this fantastic graphic from fivethirtyeight. - The Franklin Park Reading Series returns tonight at 8pm with an all-star lineup at Franklin Park (and $4 pints!). - The Crow Hill Community Association hosts their October meeting tomorrow night in the Gospel Tabernacle Church (725 Franklin) at 7:30. UPDATE: This event is TOMORROW, Saturday, October 13th, and not Sunday as previously stated. Apologies to all for the misinformation. Has it been another year already? Just yesterday, it seems, Barboncino Pizza was the new kid on the block, and now they're celebrating their one-year anniversary with a neighborhood appreciation day, offering FREE brunch, this Saturday morning. DNAInfo's Sonja Sharp gave them a nice write-up last week, complete with some info on just what, exactly, a brunch pizza is (answer: delicious), and ILFA will have a short interview with owner Ron Brown posted later today. But put Saturday on your calendar, and come celebrate with Barboncino. 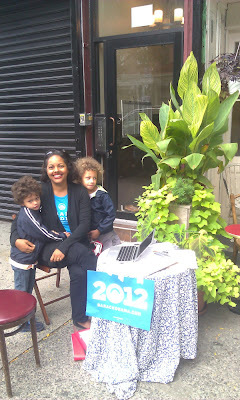 Organizers/Hosts: Raquel Wexler and 739 Franklin. It's our fall blockbuster reading! On October 15, we'll be featuring fresh fiction from notables on large and small presses: Legendary author A.M. HOMES (May We Be Forgiven, The End of Alice), hot new stars EMMA STRAUB (Laura Lamont's Life in Pictures) and MARIE-HELENE BERTINO (Safe as Houses), and two of the most acclaimed authors in indie publishing, MICHAEL KIMBALL (Big Ray, Us) and SCOTT MCCLANAHAN (The Collected Works of Scott McClanahan Vol. 1)!!! THANKS TO OUR SPONSOR: The website SMALL DEMONS (smalldemons.com) will be providing a $1 discount on the first 100 drinks, beer or well (this means you can get your first pint for just $3! ), plus coasters with fascinating lit quotes. And we'll be raffling off some awesome Small Demons merch! A.M. HOMES is the author of the novels May We Be Forgiven, This Book Will Save Your Life, Music For Torching, The End of Alice, In a Country of Mothers, and Jack, as well as two story collections, Things You Should Know and The Safety of Objects, and the memoir The Mistress’s Daughter. Her books have been translated into twenty-two languages. She has published fiction and essays in The New Yorker, Granta, Harper’s, McSweeney's, One Story, The New York Times, and Vanity Fair, where she is a contributing editor. She lives in New York City. EMMA STRAUB is the author of the novel Laura Lamont’s Life in Pictures and the story collection Other People We Married. Her fiction and non-fiction have been published by Tin House, The Paris Review Daily, The Wall Street Journal, The New York Times, Time, and Slate, and she is a staff writer for Rookie. She lives with her husband in Brooklyn, where she also works as a bookseller. MICHAEL KIMBALL is the author, most recently, of the novel Big Ray, as well as the novels Us, Dear Everybody, and The Way the Family Got Away. His books have been translated into a dozen languages. His work has been featured on NPR's All Things Considered and in the Guardian, Vice, Bomb, and New York Tyrant. He is also responsible for the project Michael Kimball Writes Your Life Story (on a postcard) and a couple of documentary films. He lives in Baltimore. Visit his website at michael-kimball.com. SCOTT MCCLANAHAN is the author of Stories V! and the Collected Works of Scott McClanahan. In 2013 Two Dollar Radio will publish his book Crapalachia and New York Tyrant Books will publish his novel Hill William. He is co-partner of the company Holler Presents. Learn more at hollerpresents.com. MARIE-HELENE BERTINO is the author of the debut story collection Safe as Houses, which received the 2012 Iowa Short Fiction Award. Her stories have appeared or are forthcoming in The Pushcart Prize Anthology XXXIII, North American Review, Mississippi Review, Inkwell, The Indiana Review, American Short Fiction, and Electric Literature’s Recommended Reading. She received a Pushcart Prize in 2007 and a Pushcart Special Mention in 2011. She was chosen as a Center for Fiction Emerging Writer’s Fellow in 2011. She hails from Philadelphia and lives in Brooklyn, where for six years she was the associate editor of One Story. That's right, it's time once again for Panama Day! Franklin Avenue was once the epicenter of the largest Panamanian community in the United States, and while many folks have moved out of the area, they still return every year to celebrate Panamanian heritage, culture, and independence (from Colombia, with a little help from a canal-hungry, gunship-sending, big-stick-carrying Theodore Roosevelt in his imperialist mode). If you've never experienced the drum-and-bugle-led parade or the fantastic food (a mix of Latin and West Indian influences - Panama's citizenry, many of whom migrated from the British West Indies to work on the railroad and the canal, is remarkably diverse), make sure you take a stroll up the Avenue. 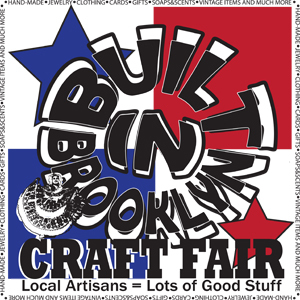 While you're at it, check out the Built in Brooklyn Craft Fair at LaunchPad from 12-6. - And don't forget the Obama fundraiser at the Candy Rush on Sunday! Slideshow of the fantastic bounty here! Buy fresh produce from RH Farms (used to be Iona Hill Farm!) and Jamerican Farmer Rodrick! Don't forget his callaloo! The CHEESE GUY - KOSHER! Yes, this time, they're really coming! We're so glad! 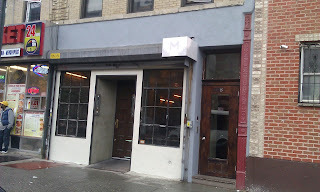 Here's what the Cheese Guy says: "My trademark is high-end, small batch, primarily handmade, kosher, artisanal cheeses. I'm excited to present cheese connoisseurs with a mouthwatering variety of cheeses. And since our runs are exclusively Kosher, we've whet the Kosher palate as well - expanding their repertoire of choices and taking Kosher cheeses to entirely new heights. The adventurous spirit will love our exotic combos like jalapeno cheddar jack and marble, local NY State sharp cheddar, and those who crave Blue Cheese should try our distinctive version made by 3rd generation Wisconsin master cheese makers. While most of my cheeses are produced domestically at family owned dairy farms, I do produce some cheeses abroad in Italy - made in the finest Italian tradition in small dairies that dot the countryside. Make sure to try our Pecorino Romano cheese aged over 18 months - it's the best of the best!" MORE VENDORS WELCOME! T: 917-756-4202! We may start programs if the community wants it! TASTES of Bklyn-EAT REAL NYC! Love to eat? Love to talk to chefs, farmers? EAT REAL NYC at Foley Square on Wednesday, Oct. 24. Farmers Market/Artisanal Market for the Day! Thanks to the Food Day 2012 team! 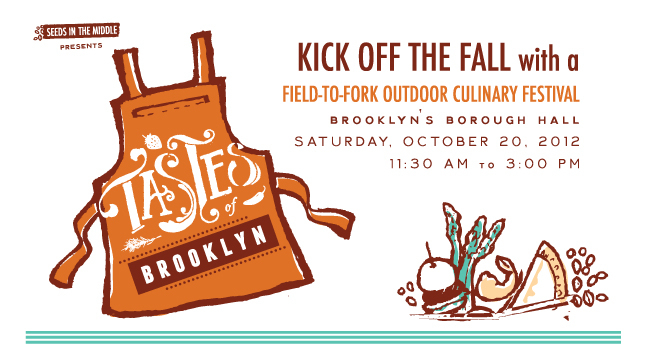 TASTES of Brooklyn Restaurants: Sign Up Here! EAT REAL NYC Restaurants: Sign Up Here! PLANT FOR FARMER ROY and the community on OCTOBER 18! Save the DATE! 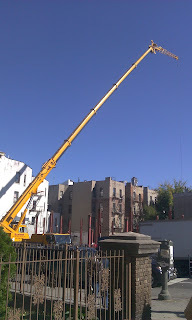 FIRST CHILDREN'S GARDEN AT HAMILTON METZ FIELD - ALBANY/LEFFERTS AVE.
NEXT TOURNAMENT ON NOV. 11! SOCCER PLAYERS FROM EVERY NABE AND NATION WANTED! Registration starts next week! Special thanks to Rea, Judd and Lily Tully for our first greenhouse!!!!! Photos to come soon! Thanks, Brown-Rudnick Charitable Foundation, Kaboom, Whole Kids Foundation, Aetna, Bronx Health Reach, CCNYC, Coca-Cola Foundation and more for all your generous support! Roy understood, and so does Farmer Rodrick, that folks in the obesity epidemic are not unhealthy because they want to be. It is due to lack of access to resources! He worked with us to right a food injustice in Crown Heights. FOLKS! YOU HAVE TO USE THE FARMERS MARKET OR LOSE IT! We want to keep our farmers here. So, buy!!! We hold fun activities every week to draw attention so people hear about us and come buy! If you'd like to honor Roy, donate! OCTOBER: Plant a children's garden at Albany/Lefferts Park (Hamilton Metz Park) on Thursday, Oct. 18 with us in memory to all who died too young. Thank you, KABOOM, for awarding us $750 the garden in a public park, and for another $750 for a mural at Public School 221 next to their new edible garden. 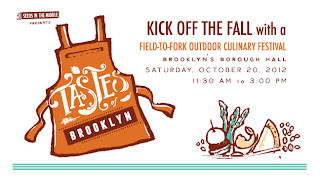 TASTES OF BROOKLYN - Buy Tickets Now! SATURDAY, OCT. 20, 11:30 AM TO 3 PM! Thank you, Edible Brooklyn, Let's Move Brooklyn and all for your support! Thank you, Saul, Brooklyn Farmacy, Egg, Fort Reno/Palo Santo, Aliseo Osteria del Borgo, Baluchi's, Black Tree Sandwich Shop, Di Fara's, Fornino, La Vara, Karloff, Locanda Vini e Olii, Lunetta, Mastellone's, Shelsky's, D'Amicos and more who have already committed. Enjoy fresh drinks - smoothies, fresh lime/lemonade with mint, apple cider - made by youth with Let's Move Brooklyn and the Healthy Retail Task Force! Entertainment - Krik-Krak Storytelling, Live Music and more - all near Borough Hall - celebrating fresh food, chefs, farmers, culinary artists. Chefs, artisans, farmers, healthy movers and shakers all welcome! Let's break a record with the BIG APPLE CRUNCH! 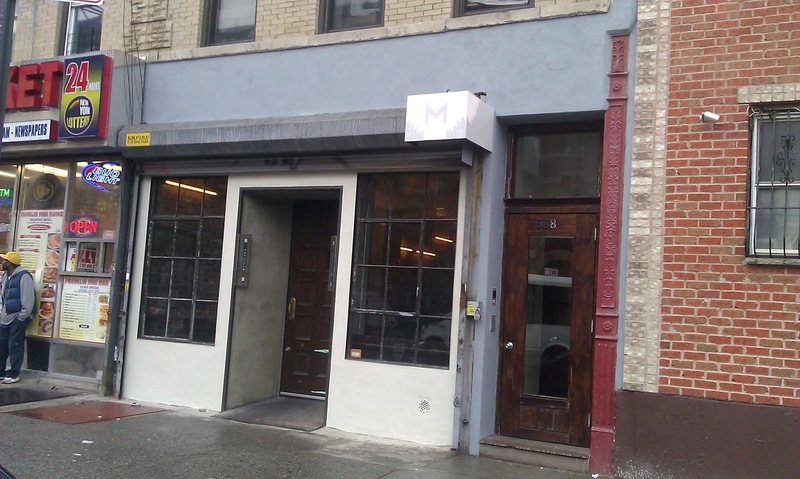 See us in the Tribeca Citizen! Chefs, Farmers, Artisans, Movers and Shakers - Join us! Chefs are joining us from every country! We got Italy, France, India, Haiti and more already! Please join the Harrison, Baluchi''s, Chez Elle and more as we go around the world for United Nations Day! Enjoy spectacular fare from seasonal produce! Shop at our Farmers Market for the Day. Thanks to our advisors, Jimmy Bradley of the Red Cat and Harrison, J. Glebocki Farms, Sue Torres, chef-owner of Suenos and more. Vendors, Farmers, Artisans: Sign up Here! See New York Times tribute here. Hear WNYC Fred Mogul's story about our market here! The Daily Record has it right! "Roy Hildebrant battled cancer like he lived his life, with courage and dignity. He taught many people the true meaning of life, how to be kind, helpful and patient. He was truly respected among his family, friends and community. Everyone that knew him, knew that he was a selfless and genuine man. He gave so much to so many and never asked for anything in return. He will be greatly missed and forever in our hearts." NYS Senator Eric Adams has it right! "An unsung hero has passed away and his void will not soon be replaced. Farmer Roy was a unique individual, a man who truly cared about his fellow human beings and gave of himself unconditionally. His legacy will live on through the Crown Heights Farmers Market. Team Adams sends our heartfelt sympathy to his family and loved ones." Farmer Roy, we would never have had that infamous squash at our debut TASTES of Brooklyn if not for you. Click here to see our first days on video! See collive's photos of Sept. 15, 2011 - opening day! Roy, we loved you for your quick sense of humor, generosity, smart business tips, kindness, compassion, people smarts, being a admirable dad, son, brother, husband and amazing fourth generation farmer with a heart of gold and just a keen awareness of the right thing to do. All, if you can, please donate to our market! We are still underfunded, struggling to survive. Even $20 will help! Rest in peace, Roy - November 27, 1963 to August 11, 2012. - with donations from Home Depot. Please tell all friends, clergy, family to come buy from our farmers! Send this to all you know. 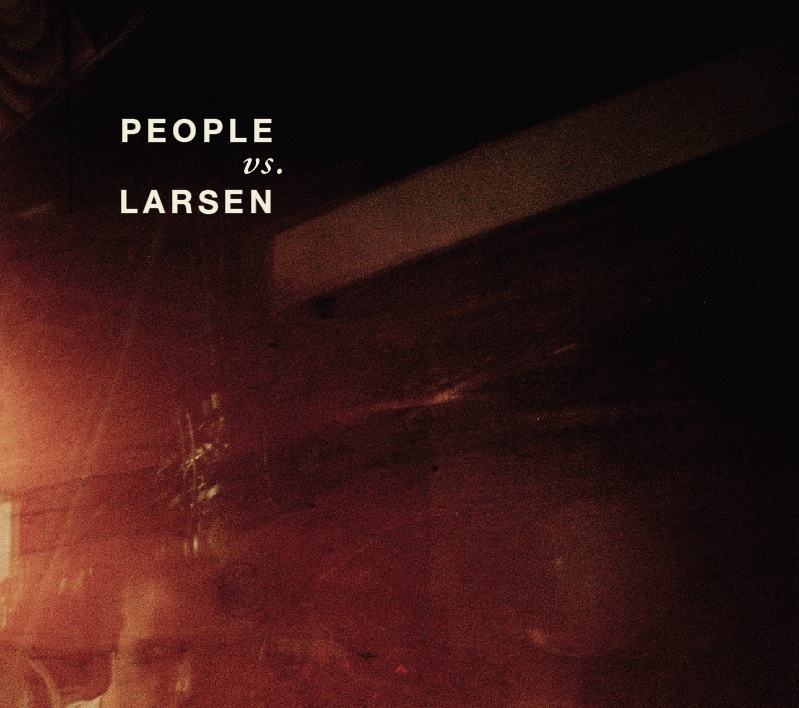 Let people know it's here.LIKE US ON FACEBOOK HERE! Keep our market alive. Use it or Lose it! FRIENDS: PLEASE DONATE to support Seeds in the MIddle! Roy, we'll never forget you. 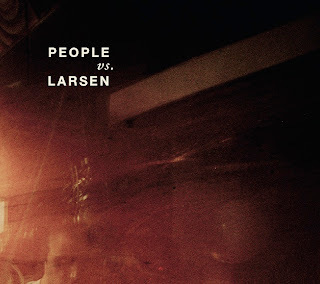 - Crown Heights-based trio People Vs. Larsen released their first album on Tuesday, and are playing around the borough in support of it. 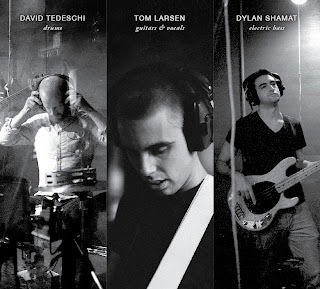 They played Brooklyn Bowl tonight, and will be at Rockwood Hall this coming Wednesday at 9pm. - Tonight also saw the kickoff of Little Sammy Squeeze and RockInOctober at The Way Station, where Tres Amigos accordionist Sam Reider will be presiding every Wednesday for the next month. A longtime friend and the director of Finding Atlas, a Brooklyn-based immigrant youth collective, has just started a great new tumblr, Welcome All You Dreamers. The complete info on the project is below, but the gist of it is simple - take a photo of yourself extending a welcome to the young people who will earn green cards through the Obama Administration's Deferred Action program. Crown Heights has a sizable immigrant population, of course, many of whom are un- or mis-documented, and it would be great to see these photos taken around the Avenue. In my own case, I decided to head down to 33rd Street in Sunset Park, where my Ukrainian great-grandparents lived for a short while when they first arrived in the the United States. While the immigrants of their generation experienced many hardships, including nativism and violence, they were, for the most part, given the opportunity to make their lives here, and most of us wouldn't be here if they hadn't had these chances. 1 in 7 Americans can trace their ancestry through Brooklyn, and today, the borough is once again a thriving mosaic of immigrant communities, Sunset Park among them. Going down to the ancestral home was also a chance to welcome the future to Brooklyn. Hundreds of thousands of young people will be welcomed into our society in a new way this year. When USCIS grants a green card they officially "welcome" someone into America, my clients and I joke about it, but it is a powerful message. USCIS may not be welcoming these incredible young people, but, finally, at least in some ways, they are being recognized here in the U.S. So let's give them a proper "welcome" from those of us who are so proud they are here. I am creating a tumblr ( welcomeallyoudreamers.tumblr.com ) , directed towards all the young people receiving DACA in the country and I need your help. 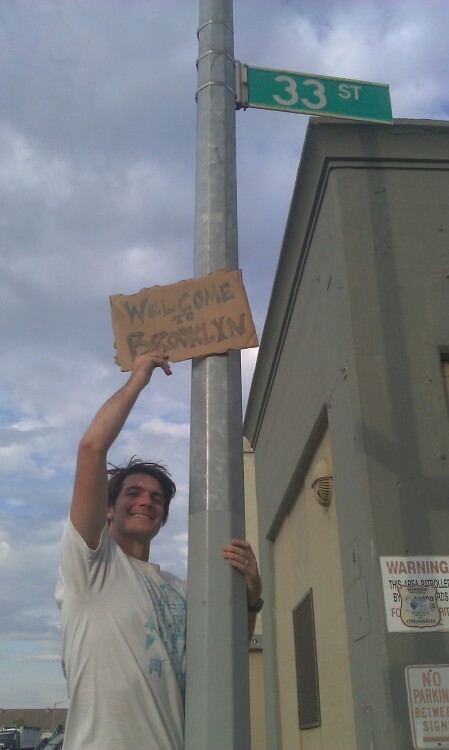 Can you send me a photo of yourself holding up a paper that says "Welcome"? It can be in any language, in any font, typed or handwritten. It can be yourself with your children your teachers, your office. It can say "Welcome to our workforce", "welcome to our schools" "welcome, we are proud to stand by your side" ANYTHING to let these young people know that there are hundreds, thousands of them who stand by their side. How about creating a video message from yourself, telling young people that you are inspired by them, that you wish the dream act was passed, that you encourage them to apply to your jobs, etc etc. Videos are so inspiring and uplifting when young people need a voice to grab them through. DO YOU HAVE FIFTEEN MINUTES? Can you forward this to anyone you know who may be similarly inspired to share a word of encouragement, of pride, of inspiration, who can help? 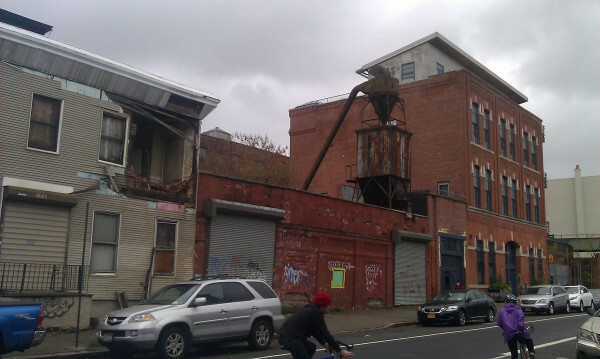 New York may no longer be a swing state (it once was! seriously! Benjamin Harrison would never have won in 1888 without it! ), but New Yorkers can still influence the upcoming election with their wallets. On Sunday, Little Zelda hosted a fundraiser that added some local fun and flavor to a national campaign that many of us follow from our various screens. It seems obvious, but it was genuinely enjoyable to actually talk to people and make donations together. For those who missed out last Sunday, never fear - there's another fundraiser this coming Sunday at The Candy Rush. For a $10 on-site donation, you'll receive a free small scoop of ice cream (this ought to bring out the youth vote). 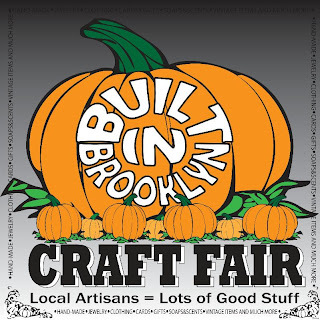 They'll also have live music and cupcakes from BCakeNY on hand. Mark your calendar!